January 25th, 2019, Charlottetown – Speed Skate PEI has named a pair of long track speed skaters to the Island’s 2019 Canada Winter Games team. Carter Bruce, from Stratford, along with Matthew McKenna, from Brackley, will compete on the outdoor oval in Red Deer’s Great Chief Park during week one, from February 16 to February 20. Matthew McKenna (left) will represent P.E.I. in long track in Red Deer in February. Photo courtesy of Amanda Burke. The selected skaters will each participate in up to five individual events, including Olympic-style races in the 500 metre, 1000m, 1500m and 5000m distances, plus a 10 lap (4000 metre) mass start race. 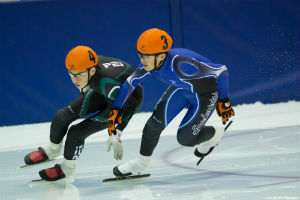 Carter Bruce (foreground, centre) will compete in long track for Team P.E.I. at the Canada Winter Games. Photo courtesy of Kristen Binns. The Island skaters will take on their regional counterparts at the Atlantic Long Track Championships in Halifax this weekend. Speed Skate PEI named seven short track skaters to its Canada Winter Games roster earlier this month.